We’d love your help. 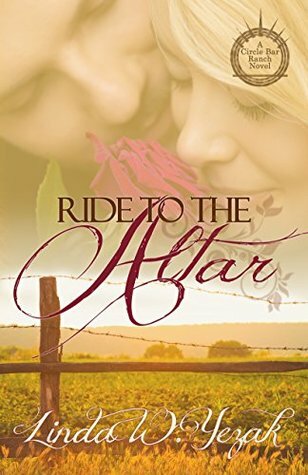 Let us know what’s wrong with this preview of Ride to the Altar by Linda W. Yezak. But that mystery isn't their only obstacle. To placate her father, Patricia must return to her hometown of Manhattan to make amends with her mother, the interfering, d Cattle are dying on the Circle Bar, putting the Texas ranch in financial jeopardy. Newly engaged Patricia Talbert and Talon Carlson must root out the cause before they can concentrate on their wedding plans. But that mystery isn't their only obstacle. To placate her father, Patricia must return to her hometown of Manhattan to make amends with her mother, the interfering, dominating woman she has hardly spoken to in a year. Her father decides it is time for them to declare a truce, but considering the depth of anger she holds against her mother, how can she? To ask other readers questions about Ride to the Altar, please sign up. The time and attention Linda Yezak put into this third of the Circle Bar Ranch series is enticingly clear. The characters fit. The story is thorough and solid, the plot magnetic. She tests the couple with their pasts, their presents, and their futures in such an adept way as to give the reader an intense "ride" toward a satisfying conclusion. Nice job. Very nice job. Linda W. Yezak holds a BA in English, a graduate certificate in Paralegal Studies, and a bucket list as long as her arm. Among the things on the list is owning a stable full of horses, and since that’s not likely to happen any time soon, she tries to include horses in each of her novels. Until the day she can retire with her husband to their land in Central Texas and ride to her heart’s content, s Linda W. Yezak holds a BA in English, a graduate certificate in Paralegal Studies, and a bucket list as long as her arm. Among the things on the list is owning a stable full of horses, and since that’s not likely to happen any time soon, she tries to include horses in each of her novels. Until the day she can retire with her husband to their land in Central Texas and ride to her heart’s content, she’ll continue with her writing and freelance editing careers.